When you have hungry mouths to feed and little time, this 20 minute chicken and spinach pasta is a win. The sauce comes together in minutes. 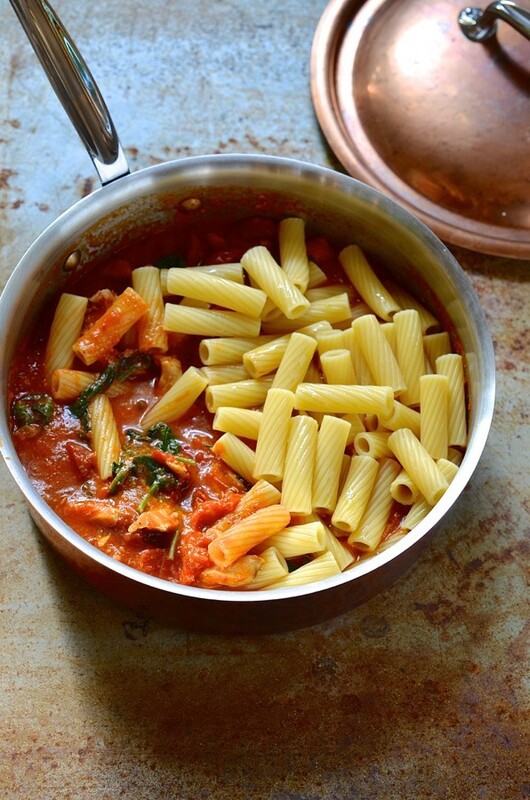 It helps to have a couple of time saving pasta recipes on standby for busy week night suppers. 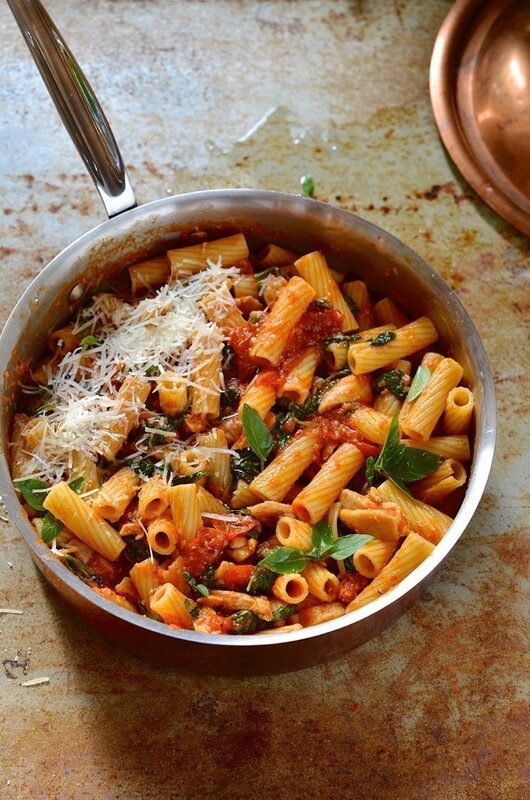 Here are some of my favourites – chicken pesto pasta, raviolii pasta bake and orecchiette pesto pasta. The ingredient list is short, as you’d expect from a recipe that claims to be quick and easy. Most are in fact, kitchen staples like, tinned tomatoes and pasta. As far as fresh ingredients go, baby spinach cooks down in minutes, although kale or Swiss chard will do nicely, too. 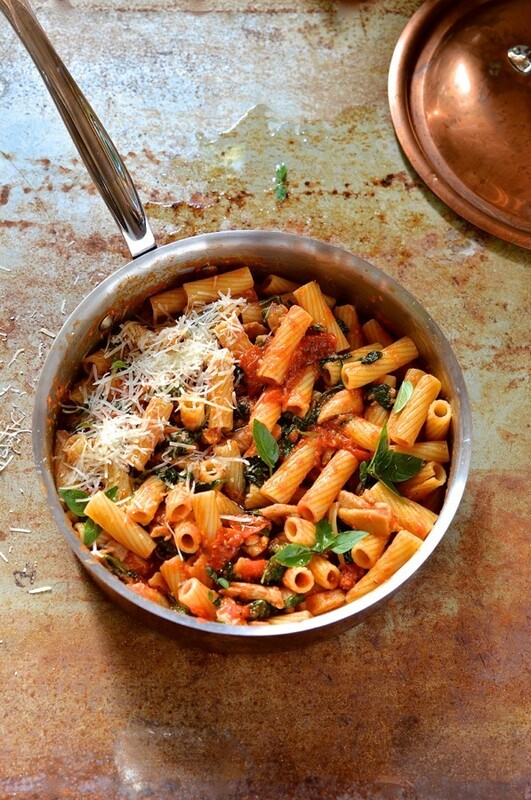 I finish this pasta with handfuls of freshly grated parmesan and basil. It couldn’t be simpler. In the meanwhile, bring a pot of salted water up to the boil and cook the pasta until al dente. Drain but remember to reserve 1 cup cooking water for later. Fold the baby spinach into the pasta sauce and allow to wilt down. This should take only a minute or two. Empty the drained pasta into the sauce and toss to coat. I always add some of the cooking water to thin the sauce down as the pasta will continue to absorb liquid when mixed into the chicken. 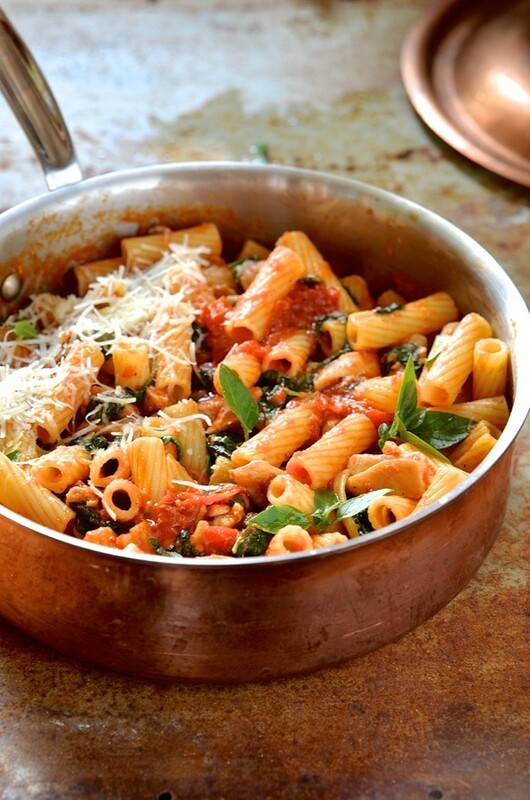 Add a generous handful of basil and half of the parmesan cheese. Fold through to combine with the sauce.